Avelina has been chosen as one of ten ladies to visit the Margrave of Thornbeck, who requested to see each one individually to choose a bride. It is his father's wish he marry fast (and someone of noble birth of course), and it doesn't matter if Thornbeck wishes to marry or not. There is something different about Avelina though. Of all the ladies there, she is the one who has not been born into a noble family....and no one knows that but her. Avelina's mistress Dorthea was supposed to be the one going, but she ran away to marry a knight. When Dorthea's father found out he forced Avelina to keep this a secret and go in his daughter's stead - but she mustn't let the Margrave fall in love with her. Despite Avelina's best attempts, Lord Thornbeck does indeed begin to take notice, and worse yet, she finds that she is also attracted to him! 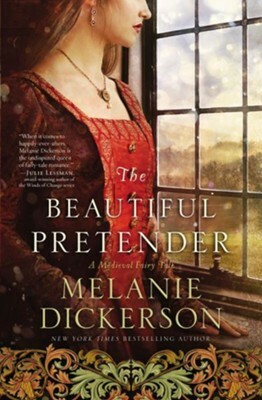 I have read almost all of Melanie Dickerson's princess books, and each one get's better and better and surpasses all my expectations. The writing becomes more solid, the characters more realistic. I'm slowly becoming a fan like my sister Korin and my Mom are, and other then The Golden Braid, this one is definitely my favorite! Avelina and Lord Thornbeck are both intriguing characters, but even more so because we know that sweet Avelina cannot marry him no matter how much she falls for his handsome face. The story has a Cinderella feel with the poor girl falling in love with the high, upstanding man, and he not knowing that she is simply a peasant, but Dickerson also weaves a fairy tale that is all her own. That being said, the book isn't 100% perfect. I'm still not a huge fan of the writing style (let's just face it - I'm picky when it comes to how a book's written), or how she chooses to describe certain things. However the story kept me interested to the end and I couldn't put it down - I didn't even think of the style of writing or what she chose to describe as I dug deeper into the plot! The ending was a bit assumed ( I predicted it just be reading the the back cover), however this still is a fun read. Dickerson always brings us an interesting Medieval tale for all of us die-hard romantics! Have you read the book yet? What did you think? Of all Dickerson's book - which is your favorite?